One the best known stories about Jesus is the tale about the adulterous woman brought before him in the Temple. And Jesus saved her life by saying Let him who is without sin among you be the first to throw a stone at her.” You'll find it at John 8 verses 1-11. As you can see, the verses are missing. This entire incident has been removed from the text. 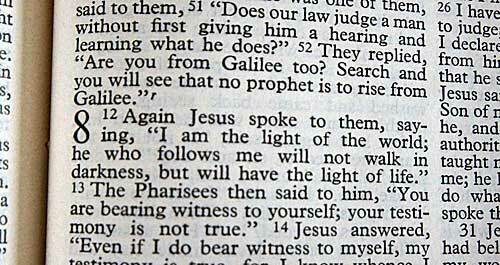 They are not totally gone, they appear, along with John 8:53 in a footnote. And for the record, here are the missing verses from that footnote. Why has this passage been removed from the text, and placed in a footnote? The key words there are "compared with the most ancient authorities." Then, and still now the oldest surviving New Testaments did not include this passage. It is not in the Codex Sinaiticus, the Codex Vaticanus, or the Codex Alexandrinus. Nor is it in the Codex Ephraemi Rescriptus, though that is missing a larger section of John, possibly due to lost pages. Thus we can be well assured that the passage was not part of the New Testament in the fourth Century. It is reasonable to conclude it is a later insertion. Interestingly, pressure (not scholarship) led the passage to be restored in the second edition of the RSV, and all the English versions online at Bible Gateway currently include it. Some of the versions do put the passages in italics to differentiate it; other versions place it in brackets with an annotation such as [The earliest manuscripts do not include 7:53–8:11], most just ignore the issue entirely. After all, why stir up an issue that might cause Christians to question the accuracy and validity of their holy book? And yet, as my RSV (presented to me back in 1956 for exemplary Sunday School attendance) clearly shows, the accuracy and validity of the Christian holy book surely should be questioned. And clearly, the Bible cannot be considered inerrant.